www.underclassblog.com — Camera FV-5 is a professional camera application for mobile devices, that puts DSLR-like manual controls in your fingertips. Tailored to enthusiast and professional photographers, with this camera application you can capture the best raw photographs so that you can post-process them later and get stunning results. The only limit is your imagination and creativity! IMPORTANT: If you find a bug using the application, PLEASE, visit the web page http://www.camerafv5.com/ or write to support@camerafv5.com with your phone model name and the description of the problem, before writing a negative comment. Customer satisfaction is our priority, and we will do our best to fix the issues as soon as possible! Connect with Camera FV-5 and stay always up to the latest information about current and future development. Visit the official website http://www.camerafv5.com, watch tutorials at http://www.youtube.com/user/camerafv5. * Requires Android 5.0+ and a fully compliant Camera2 implementation. Currently only LG Nexus 5 and Motorola Nexus 6. Approximate location and precise location: only used for geotagging functionality (disabled by default, and requires manual GPS activation). Modify or delete the contents of your USB storage and take pictures and videos: required for the usual camera operation. - Improved: revamped multilanguage support. Now region-specific languages are shown and used. When available, multiple scripts are also supported (for instance, cyrillic and latin for Serbian). - Fixed: app crashing on the Samsung Galaxy S7/S7 edge after updating to Android 7.0. - Fixed: issue with the custom storage folder not being taken into account after being changed. - Improved: autofocus performance on continuous mode. 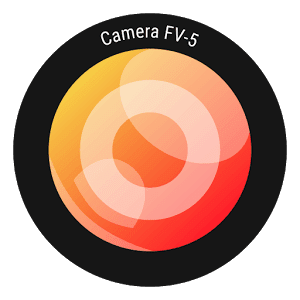 NOTE: If you experience difficulties with downloading Camera FV-5 3.27.1 Patched APK from given links below, please try to login first to those file hosting before download (it's free to create an account), make sure to uncheck "Use our download manager and get recommended downloads" or similar, if any.